There are many 5 star hotels in Salerno, but the Hotel Raito is ideal for those who want to enjoy an exclusive stay in Salerno in one of the most suggestive locations of southern Italy. The color of the sea and of the surrounding nature make the landscape spectacular. As a fabuolous luxury hotel Salerno, the Hotel Raito is ideal both for couples looking for privacy and tranquillity and for those families who dream of a holiday of total relaxation. Any doubt on which of the 5 star hotels Salerno you could spend your holiday? The Hotel Raito is the perfect choice thanks to the SPA, the rooftop restaurant and different types of rooms ready to satisfy everyone's request and meet the needs even of the more demanding visitors. Campania 5 star hotels, Hotel Raito, is also ideal for those looking for a classy location for a wedding. Our staff follows the bride and groom for the duration of the preparations, the organization of the event, through the choice of flowers, of the menu up to the accompaniment of music. Our elegant and sophisticated restaurant is housed in one of the most 5 star hotels in Salerno. Luxury hotel in Salerno? 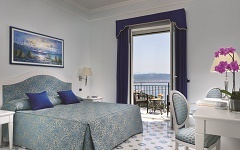 We are waiting for you on the Amalfi Coast in our hotel with spa: choose the Hotel Raito for your 5 stars stay!